Artist Tom Estes has entered the cartoon realm of Loonytunes, creating a Roadrunner inspired 'portable hole' from the darkest material ever made. The work, staged at the Solomon R Guggenheim in New York is interspersed between John Chamberlain's monochromatic welded iron-rod sculptures and the paintings of Wassily Kandinsky- as well as being a tribute to one ofthe the museums unsung founders. A new work by artist Tom Estes called ‘Portable Black Hole’ is made from a carpet of carbon nano- tubes reflects 0.045 percent light, making it 100 times darker than previous discoveries. The nanotech-based material now developed by a team of 10 technologists at the NASA Goddard Space Flight Center in Greenbelt, Md., is a thin coating of multi-walled carbon nanotubes — tiny hollow tubes made of pure carbon about 10,000 times thinner than a strand of human hair. ‘Portable Black Hole‘ is an artwork with a successful science and pop-media crossover- and with a fascinating technology. The discovery will allow an increase in the absorption efficiency of light as well as the overall radiation-to-electricity efficiency of solar energy conservation. The material could help scientists gather hard-to-obtain scientific measurements or observe unseen astronomical objects. It could also one day be used to deliver medicine in humans, build bridges, and conduct electricity inside of semiconductors. Though ‘Portable Black Hole’ was dreamed up after lengthy research into scientific discoveries, it is the works connection with its own context of display that truly intrigues. So while the work was inspired by the Roadrunner cartoon and one of the ludicrous devices from that fictitious mail-order company, The Acme Corporation, it was also inspired by Hilla Rabey, the first Director of The Solomon R. Guggenheim Museum. Hilla Rabey was a strong willed and confident woman and part of a coterie of art directors who brought European modern art in the United States. But even more importantly, she was the person who originated the Guggenheim Museum. Rabey's vision for the direction (as well as the name) for the new museum was strictly one of Non-Objective art. Non-Objective art for Rebay was not only a new aesthetic but held a spiritual dimension. She made it quite clear that there was a difference between Abstract Art and Non-Objective art. According to her belief, Abstract Art was an abstraction of some object from life: while Non-Objective painting was completely pure, devoid of any connection or association with what is seen in the world. For her "temple" of art, Rebay envisioned a circular building with no stairs for the display of the paintings that she and Solomon Guggenheim had spent so many years collecting and were so profoundly dedicated to. Yet despite her achievements, persistence and single-mindedness in forming a unique museum few people today are familiar with the name of Hilla Rebay. After the death of Solomon Guggenheim the term 'Non-Objective art' was largely written out of the history of the museum and was instead dedicated in his honour. And the name of Hilla Rebay was eliminated from any literature catalogs, lectures or history of the museum. Its almost as if she fell into a black hole. Scientists believe a Black Hole is a region of space-time from which nothing, not even light, can escape. It is called "black" because it absorbs all light, reflecting nothing. 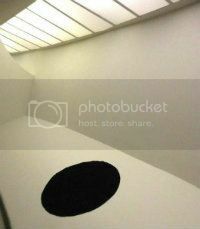 And it is this concept of the Black Hole that closely resembles the scientific properties of Estes' art object. Estes' use of this new real-life scientific material is a playful response to a real life situation, conceived with a casually humorous lightness of touch. For Estes, fantasy and illusion are not contradictions of reality, but instead an integral part of our everyday lives. And indeed, what better place for this cartoon-esque representation of an alternative reality than within The Guggenheim with its domed skylight and ramp? After all, this inverted Ziggurat that spirals down like a vortex was first dreamed up by Hilla Rebay herself. good. 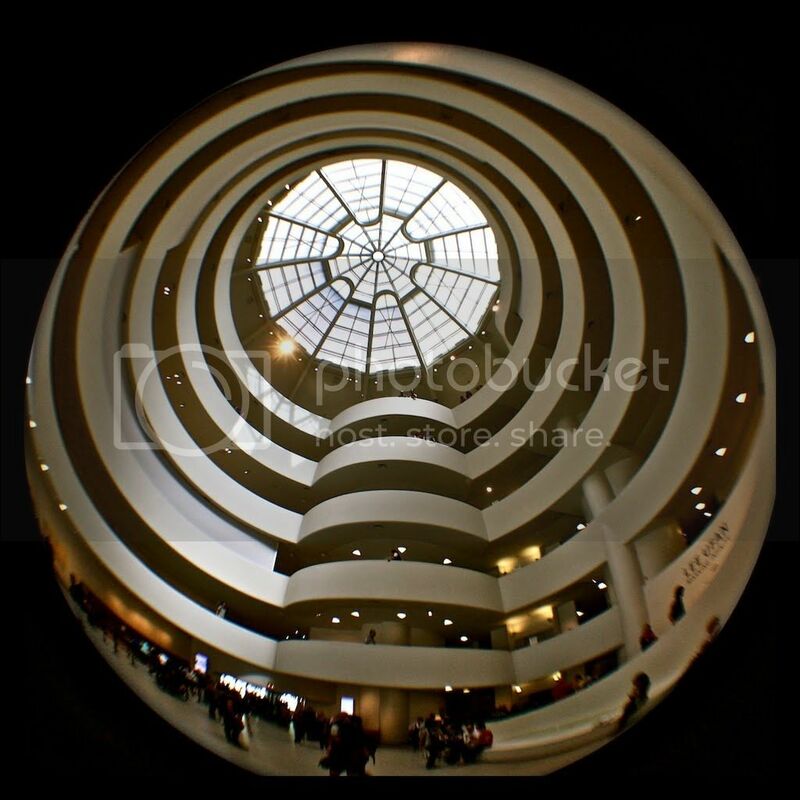 "black-hole" resonates within the guggenheim on other, apparently unintended levels: frank lloyd wright originally conceived of a building defined by a spiraling, cantilevered ramp in the context of the "gordon strong automobile objective", which was supposed to contain a central planetarium. this building was never constructed, and when wright was later approached by hilla rebay/solomon guggenheim, and asked to design a museum of non-objective art, wright basically just picked-up the original design for the gordon-strong building and adapted it: by turning the building inside-out and upside down, essentially. the outside car ramp became an inside gallery ramp, and the "ziggurat" was inverted. however: in the early designs for the guggenheim, wright continued to feature a planetarium. what makes this especially interesting, is that (to my understanding) neither gordon strong nor hilla rebay ever requested such a feature. 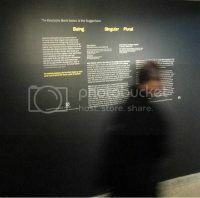 at any rate: "astronomy" is in the guggenheim's dna, although the expression of that gene has been somewhat suppressed. however, i don't know if the black-hole metaphor is a good fit for hilla rebay in particular– because in order for a black-hole to be created, we must have the collapse of a star of sufficient mass and internal gravity to bring-about an event horizon. the baroness rebay was a individual of spectacular will, and in the correct circumstances, persuasion; but i do not think we can compare her to a star of any great magnitude. because she did not really shine of herself: she was extremely clever, at adopting/adapting and proselytizing the ideas of others (kandinsky) and at convincing the powerful to implement those ideas (guggenheim) in a spectacular fashion (wright). and granted, we might nuance the stellar metaphor to say that hilla rebay was especially good at "capturing" the matter of others; but even in making that allowance, rebay never created out of herself anything approximate to a lasting solar system; and her influence over the guggenheim didn't end in any spectacular downward spiral (she was not lady macbeth) but rather when the board and heirs of solomon guggenheim decided to cut-her-out. she was isolated and easily contained; a true black-hole would have taken everything with it. in this case, i would suggest that the actual black-hole is: the compulsive need of post-modern awareness for an ever-expanding babushka program of critique and self-critique, in an expanding series ad infinitum. 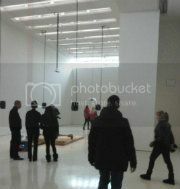 Some fascinating background information on The Guggenheim. However Estes is known for his meticulous research on context. So not sure what makes you say that it was "apparently unintended". "…rather than create some heavy-handed tribute, artist Tom Estes has created a statement on the treatment of Hilla Rebay that is invoked with a minimalism and a modesty that is as comic as it is cosmic"
The focus is on 'the treatment' of Rebay not on the individual. That is to say, he is representing absence- the unseen and unrepresented; multiple conflicting realities that exist side by side with the official or recorded ‘histories’. This is then reinforced by the quote from the artist: "It’s almost as if she fell into a black hole."